At CORROSION 2018, NACE International commemorates a milestone anniversary and looks ahead to what’s in store for the corrosion industry. In 1943, eleven engineers from Houston’s pipeline industry came together to form an organization dedicated to the study and practice of corrosion prevention. Seventy-five years later, that organization, NACE International, is made up of over 36,000 members -- corrosion engineers, scientists, researchers, technicians, asset owners, and inspectors dedicated to the prevention and mitigation of corrosion worldwide. 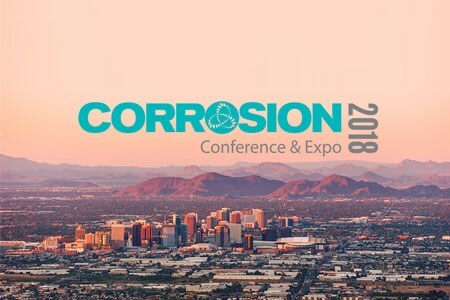 At the association’s CORROSION 2018 Conference (Phoenix, Arizona; April 15-19) attendees will get to walk through NACE’s historical milestones since 1943 and get an in-depth look at the latest technologies, research, and equipment — like corrosion-sensing drones and self-healing nanocoatings— that are driving industry innovation. For the first time, the NACE Foundation’s University Student Design Competition (USDASC), will be hosted in conjunction with the CORROSION Conference. Now in its third year, the competition challenges student teams to design and build an autonomous system for corrosion inspection and detection in hard-to-access areas. Each team will give a 20-minute presentation prior to a live demonstration of their inspection device. Teams include the United States Air Force Academy, Louisiana State University, George Mason University, the University of Akron, the United States Military Academy (West Point), the United States Naval Academy, Penn State, Texas A&M University, and McMaster University. In keeping with the theme of engaging young people in science, technology, engineering and math (STEM) related fields, CORROSION will also welcome local high school students to participate in a day-long mini-camp hosted by the NACE Foundation. Students will conduct hands-on corrosion experiments and tour the exhibit hall to learn more about the corrosion profession and explore whether they want to consider a career in corrosion control. Meanwhile, at the Corrosive Chronicles theater, NACE members and industry leaders will share their expertise and stories from their careers-- whether it’s a memory of a tough lesson learned or a humorous anecdote from the field. This commemorative exhibit invites attendees to walk through a timeline of NACE’s history where they will be able to explore vintage corrosion technology and milestone moments from the past 75 years of corrosion science. NACE’s flagship five-day event is known throughout the industry as a “can’t-miss” opportunity because it is where the newest technical information is first announced, and it is where businesses release new products. CORROSION offers something for every industry sector and job level involved in corrosion prevention with 19 industry-specific and technology tracks and 450 exhibitors. For more information and to register for CORROSION 2018, please visit www.nacecorrosion.org.